SCVHistory.com LW3486 | William S. Hart | Yesterday's Headliner: ''Smiling'' Bill Hart, 1936. 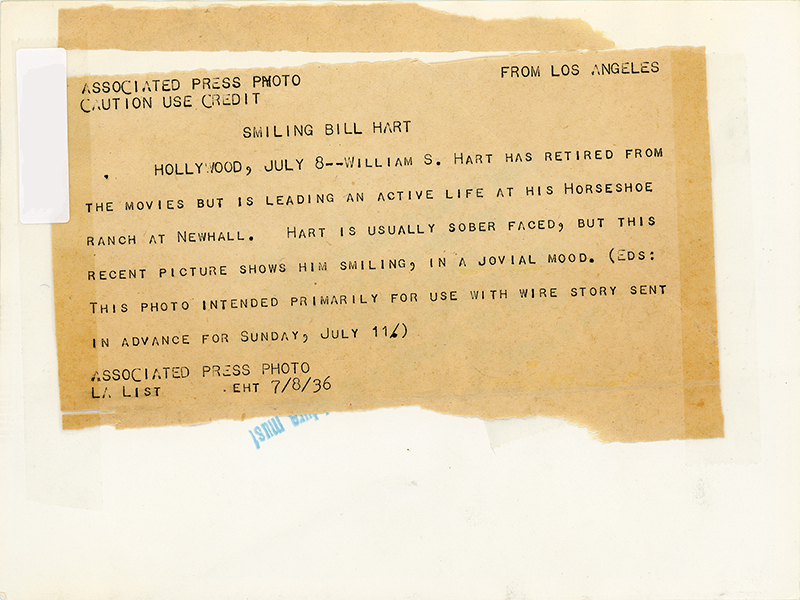 The 6x8-inch print was meant to accompany an Associated Press feature on Hart for publication Sunday, July 12, 1936. ("Sunday, July 11" in the cutline is in error.) The Hart feature was the eighth installment in a weekly series titled "Yesterday's Headliners" (alternately "Headliner"). Some papers ran the photograph with the story, such as the Rochester (N.Y.) Democrat and Chronicle, but most seem to have run different "then and now" photos. It had been 11 years since Hart made his last film, "Tumbleweeds." The SCVHistory archive demonstrates that Hart actually did smile when in the company of friends and fans. But in 1936 he didn't have a lot to smile about publicly. The anonymous AP writer states (below) that Newhall's most famous citizen is "not the least bit sorry that his days of celluloid celebrity have passed" — showing that the writer didn't know his subject very well. It would be interesting to know Hart's reaction to the term, "Yesterday's Headliner." Perhaps the most significant factoid in this article is Hart's woeful admission that he lost $270,000 in the bond market with the Crash of 1929. No. 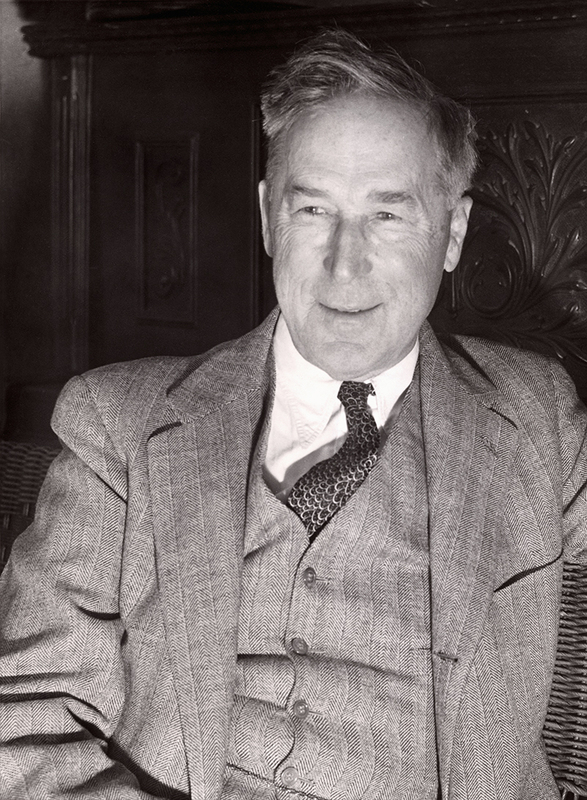 8 — William S. Hart. Bill Hart, Two-Gun Film Hero, Gets $1,000 A Week. The Associated Press | As published in the Cincinnati Enquirer, Sunday, July 12, 1936. Newhall, Calif., July 11 — "Two-gun" William S. Hart, the well-remembered star of scores of Western thrillers of the silent days, presides over 200 rugged acres, not the least bit sorry that his days of celluloid celebrity have passed. His huge white mansion, on the top of a hill reached by a narrow, winding road, overlooks this tiny semi-desert town, with Hollywood 20 miles away. Political machinations and misunderstandings, Hart says, forced him, the outstanding "Western" star of his day, into retirement 10 years ago. He had been making pictures since 1915. Before that he was on the stage. Always conservative, Hart came to the ranch here with the savings of a successful screen career intact. His pictures earned several million dollars, but how much of it accrued to him, or how much he has been able to save, is something he doesn't discuss. When, in the early 1920s, he began making his own films, his profits were estimated as high as $10,000 a week. Early this year, in an action in New York for an accounting of profits of his picture, "Tumbleweeds," Hart was awarded $85,000. "The slump of 1929 cost me $270,000," Bill will tell you. "Every cent of it was in bonds I believed never could fail." Hart passes much of his time now in superintending his ranch and in writing. He has from five to seven men, depending on the season, looking after his horses, his fences, his gardens, his swimming pool, his cars, and his trucks. His sister, Mary, an invalid, lives with him. "For a guy who's getting on, there's plenty for me to do," said Hart, who is past 60. "For one thing there's a lot of mall. I'd say there are about 300 letters a week. I answer many of them and send pictures. I'm also working on a book of short stories." Hart learned to ride as a youngster, but did little after going on the stage. Perhaps the fact that he originated the role of Cash Hawkins in "The Squaw Man" caused him to turn "Western" hero when he started in the movies. The two-gun film star was married but once. His wife, from whom he subsequently was divorced, was Winifred Westover. Their son, William S., Jr., now nearing 15 years, is tall as his father and well-built. He lives with his mother in Santa Monica. LW3486: 9600 dpi jpeg from original photograph purchased 2019 by Leon Worden.